Elaine O’Rourke, C-IAYT Yoga Therapist & Teacher, Sound Healer, EFT & Reiki Practitioner, Recording Artist is based in Gloucester, MA, USA. 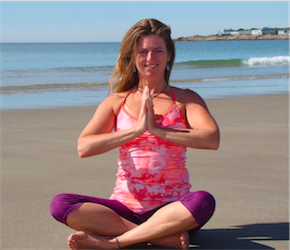 Specializing in yoga RETREATS, EFT, yoga therapy and making yoga fun especially on the beach. She has the versatility, experience and knowledge to guide you through a practice that is appropriate for your body and your unique constitution. Since 2003, she has been teaching a wide variety of group classes to diverse populations. In private therapeutic sessions (online or in person) she draws from her own personal experience of living with Crohn’s disease and an Ostomy to teach and empower others in similar situations. She is the creator of “Surviving to Thriving: Overcoming Ostomy Challenges so you can Live a FulFilling Life“. Her Sound Healing Journeys are exquisite and powerful. She combines her gifts of music with her understanding of the energy systems to guide you into deep relaxation and a place of healing.